Appareil et procédé de spectroscopie et/ou imagerie RMN à facteur de remplissage et amplitude du champ RF améliorés. The present invention concerns an apparatus (1' ) for NMR spectroscopy and/or NMR imaging of a sample. The apparatus comprises a static probe comprising an outer coil for excitation of nuclei of said sample by generating an incident radio frequency field at the Larmor frequency of said nuclei, and for reception of a return radio frequency field emitted by said sample, and a sensitive inner coil (6a' ) which is mounted closely around or in contact with the sample container and which is wirelessly coupled to said outer coil by an electromagnetic radio frequency field. 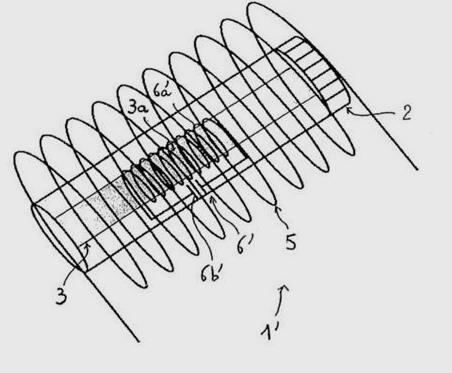 The sensitive inner coil is embedded in an inner spinning rotor (2) which is rotatively mounted inside said static probe and which is integral with said sample container, so that the filling factor and the radio frequency field amplitude in said sensitive coil are maximized.